Done some time in 2005 for a how to draw book, It's supposed to be 'Nessie' but I just drew and actual Plesiosaurus. Both of these were colored by my wife. For some reason this image never shows up right, it looks muddy on my machine but what are you gonna do? 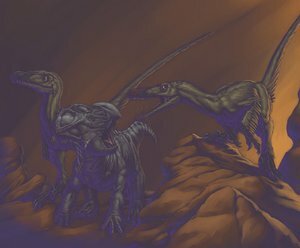 Velociraptors attacking a Protoceratops. For Nessie reminds me to the new Papo figure. Raptors are hard to draw, they have large heads for their tiny bodies and they are sometimes so very gracile they look a bit odd when drawn. Hey there. Love your art. Do you take commissions at all? I'm sorry I no longer do commissions, just no time. At first I read that as "Plesiosaurus vs. Velociraptor." Not THAT would have been interesting, heh. 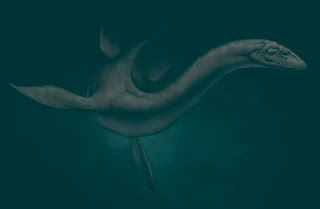 I like the coloring on the Plesiosaurus - really does remind me of something swimming through the inky depths of the Loch Ness. Great work, as always.